It's the middle of the Dry Season in northern Australia. Rain is sparse and forests and grasslands are tinder dry. This is the time of stress for the plants and animals. Few insects are about as indicated by our trapping activities. Cassowaries, Jungle Fowl and Brush Turkeys are hungry since there is little fruit and few flowers on the ground. So it was a pleasure to discover something interesting. Forest Marbles, for lack of a better word- the formal name is Fungus Root but the plant is not a fungus and so the common name is misleading. They are fairly prominent on our property. 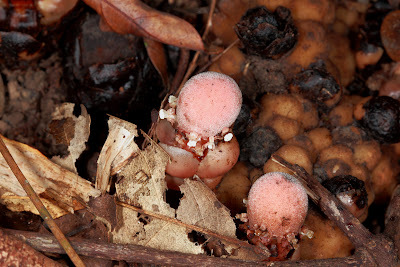 Forest marbles, Balanophora fungosa, are flowering plants but they have no chlorophyll. 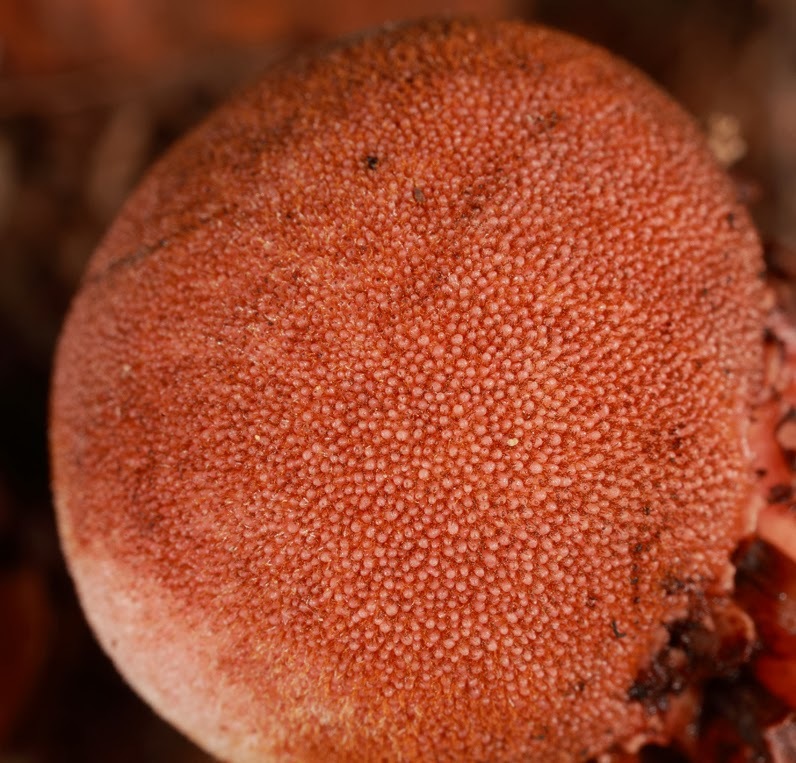 Some 15 species are known in their family, the Balanophoraceae, occurring in SE Asia, Fiji and India. 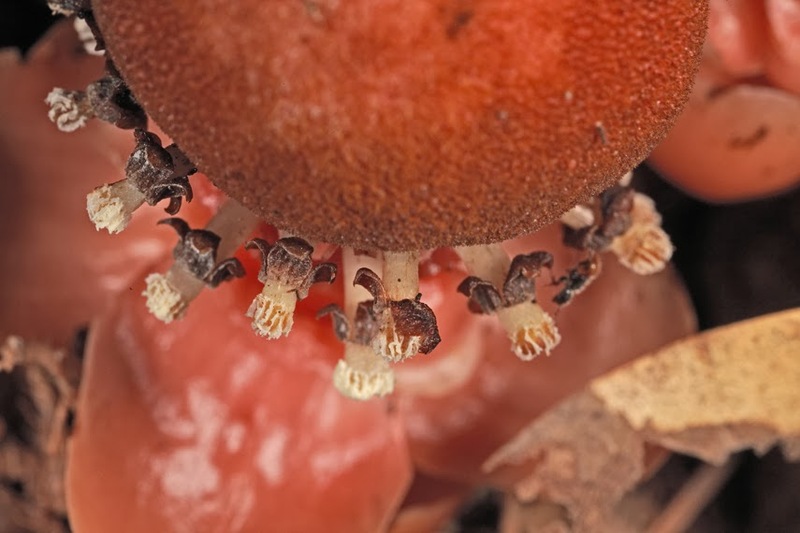 These plants are parasitic on the roots of rainforest trees. 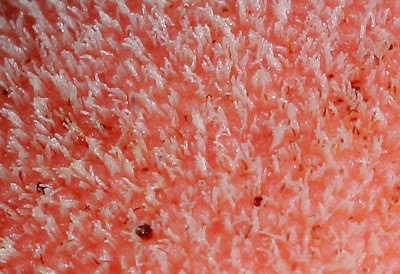 The little marbles measure about 20 mm and this pink structure is called a stalk. 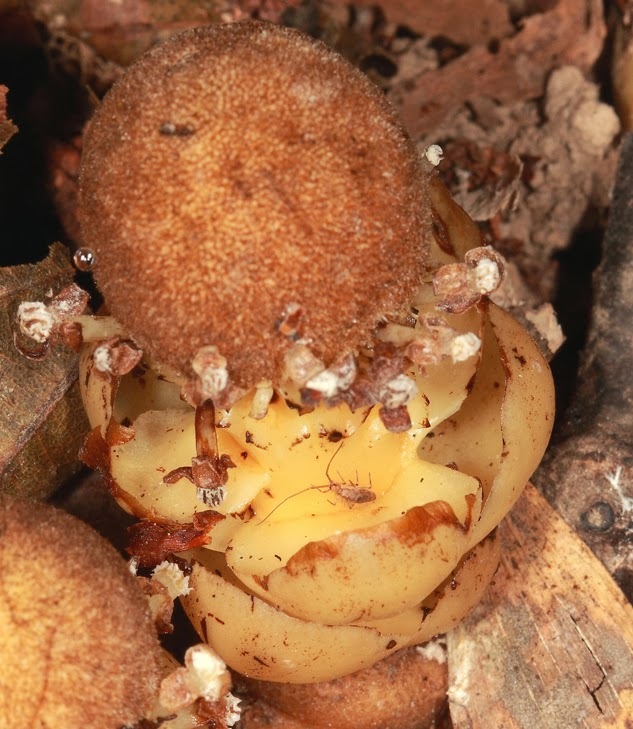 The shell-like pieces below the stalk are the leaves and the white appendages are the male flowers. Developing stalks are in the background. Here we see some leaves and male flower stalks. 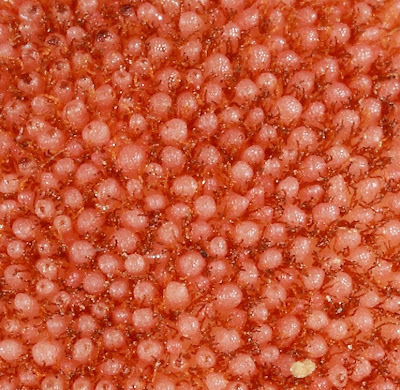 Female flowers are on the "marble" itself and appear here as fine sand grains. These nubbins are really not the flowers. The flowers are actually between these buttons. Flowers in between the buttons. These flowers are so small that they rank among the smallest flowers in the plant kingdom. Above we see the female flowers fully open and receptive to pollen. A ring of male flowers. Note the fleshy pink leaves below. An individual male flower. 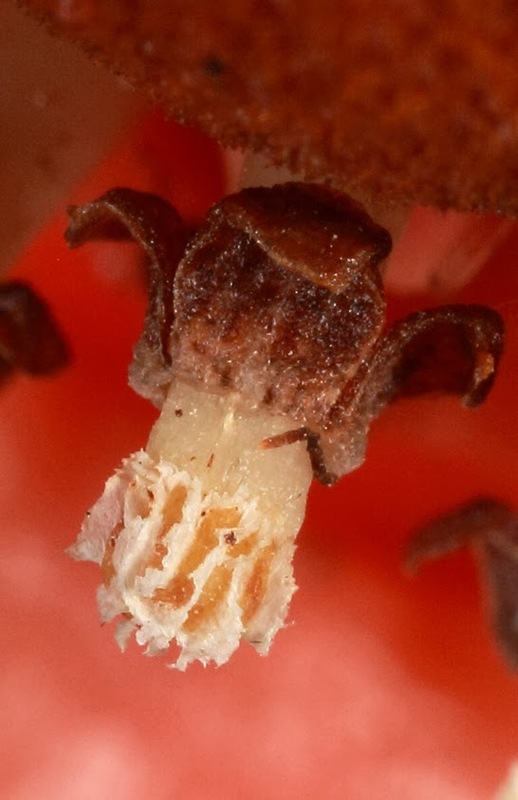 The anthers are the papery structures and contain the pollen. The dead, brown structures are like "leaves" but they are really not leaves. Flowers and pollen are attractive to insects. 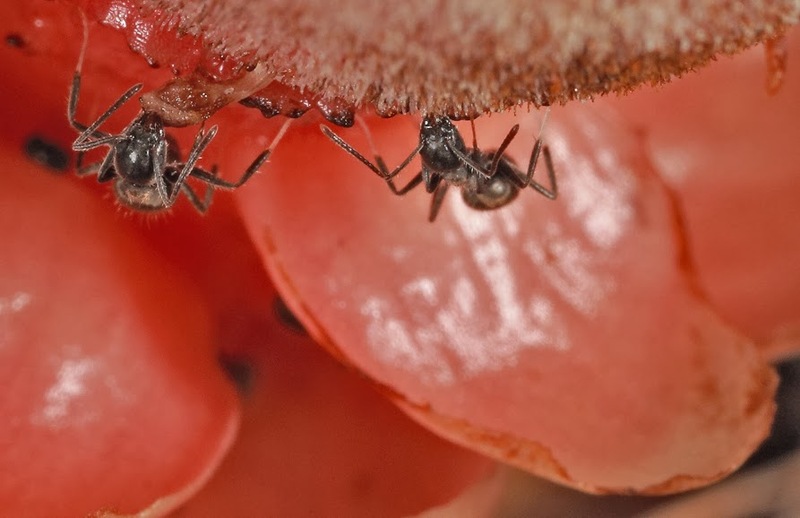 Here we see ants feeding on sticky exudates of the female flowers. This Springtail (Collembola) is probably feeding on pollen. Although a few insects have been observed feeding on the Marbles, it seems they are not attractive to vertebrates. The turkeys, cassowaries and jungle fowl avoid the plants and there is no evidence of rat or bandicoot feeding either. The plant has some medicinal uses. 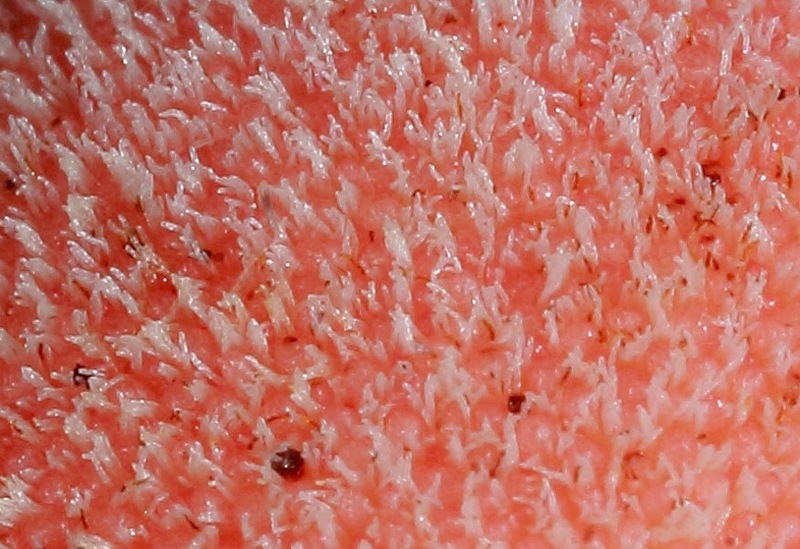 It has been used to cure internal haemorrhaging, piles and have a strong antioxidant quality. 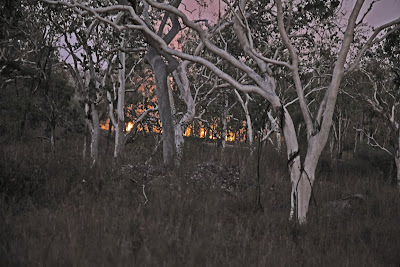 Last night Buck and I headed out to the bushland north of Mareeba for some light-trapping and nocturnal photography. We had just settled down for a beer after setting up the light sheets when a vehicle came down the road and stopped about 300 m away. Shortly thereafter we discovered that the driver had set a fire. This is not unusual in this part of the country where grazers and landowners "control burn" annually or sometimes more than once a year. Reasons for this practice are a mystery to biologists because in this locality no cattle are grazed so there is really no need to burn. The rainy season is just a month or so away, so why burn? Burning opens up the countryside but it kills all sorts of wildlife and plants. All seedling trees and shrubs are killed and nesting birds and small lizards and insects get consumed by the flames. 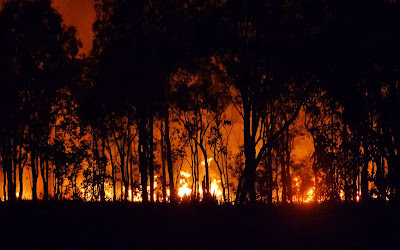 As the fire grew, we thought it best to leave even though it was across the road and separated by several meters of sandy soft shoulders. We were certain that the fellow who had lit the fire was not aware of our presence. If he had been, then we are sure he would have told us--we hope! We moved to Grievson d, near Koah, a habitat replete with interesting plants and a nice fauna. It is seldom burned and this is reflected in the diversity of native plants and the comparatively small number of introduced weeds. 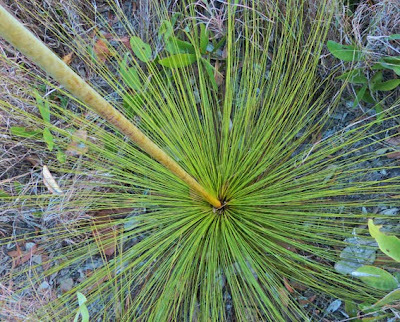 Northern Forest Grass Trees, Xanthorrhoea johnsonii are common in this locality and seem to harbour a wide variety of insects. 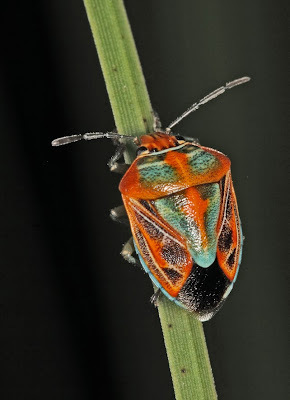 We have seen this little pentatomid bug at Grievson Rd before. 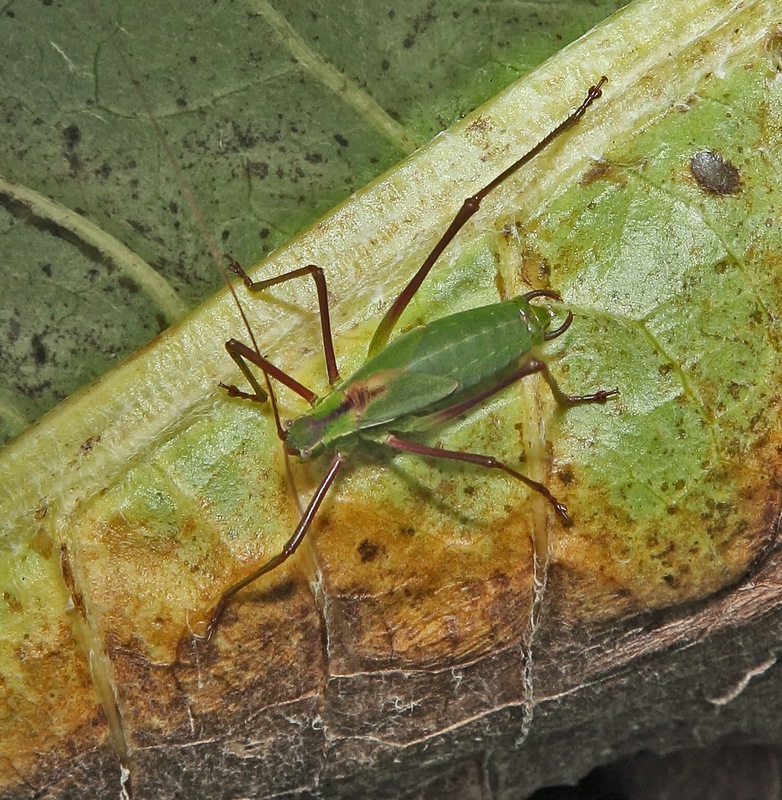 This undescribed species of the cricket genus Aphoniodes reduces its size by stretching out on a Grass Tree Leaf when it is disturbed. This morabine grasshopper is associated with Xanthorrhoea. It feeds on the leaves and probably deposits its eggs in the detritus that accumulates in the leaf axils. The Pandanus Cockroach, Megamareta phaneropyga, is usually found in pandanus stands. Its distribution extends beyond pandanus and it occurs on other plants such as Xanthorrhoea. Tiny hylid frogs spend the days deep in the axils and in the brown skirts of dead leaves at the base of large Grass Trees. It is extremely dry in this habitat at this time of the year but after dark there is a considerable dewdrop that serves to keep these small predators lubricated. 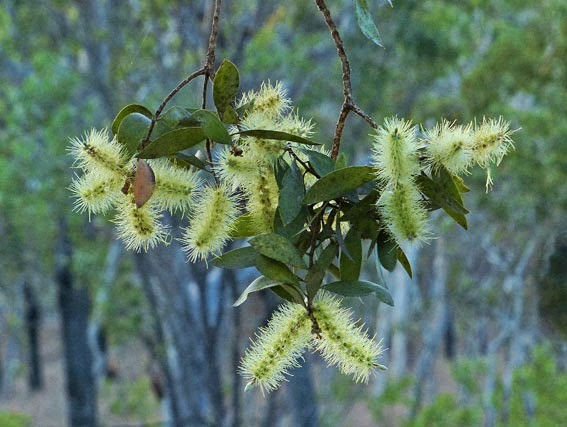 Bushman's Clothes Pegs, Grevillea glauca is an outstanding shrub that is attractive to a wide variety of insects and nectar-feeding birds. A Golden Orb-weaving spider, Nephila pilipes, has spun her web in the midst of the Grass Trees and shrubs. 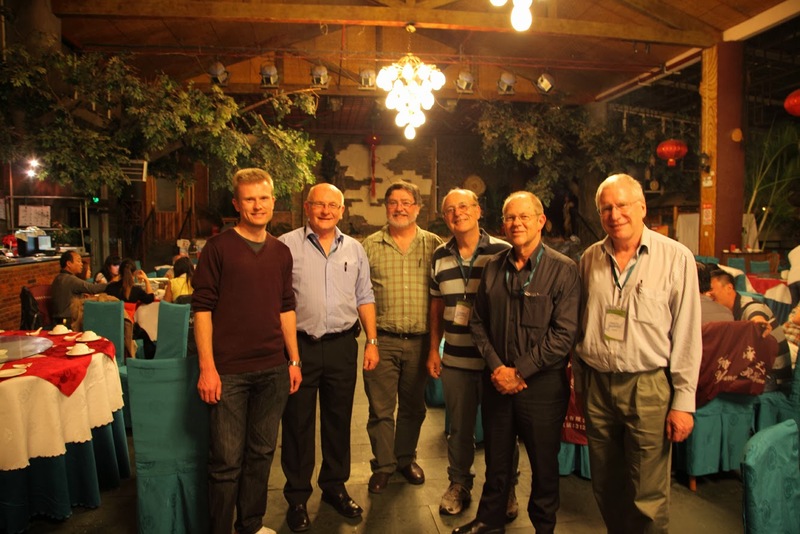 The Orthopterists' Society met last month in Kunming, Yunnan, China. Yunnan Province is in the southern part of the country and we were not far from the border with Myanmar. Insects seemed few and far between out in the country. Seasonally it was the right time to be there but not much was seen. 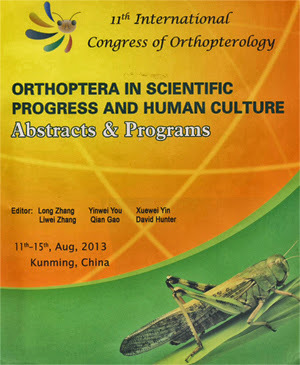 The orthopterans were conspicuous by their absence. 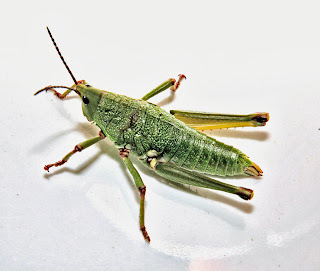 The grasshopper above is a wingless pyrgomorph. The two katydids above were found in a high mountain meadow and seemed restricted to a large-leafed composite plant. The were identified as Anormalous zhangi Liu, a species previous known only from males. Further photos of the trip can be viewed on: http://www.flickr.com/photos/naturenoises/ in the "Orthopterists' Society" set. 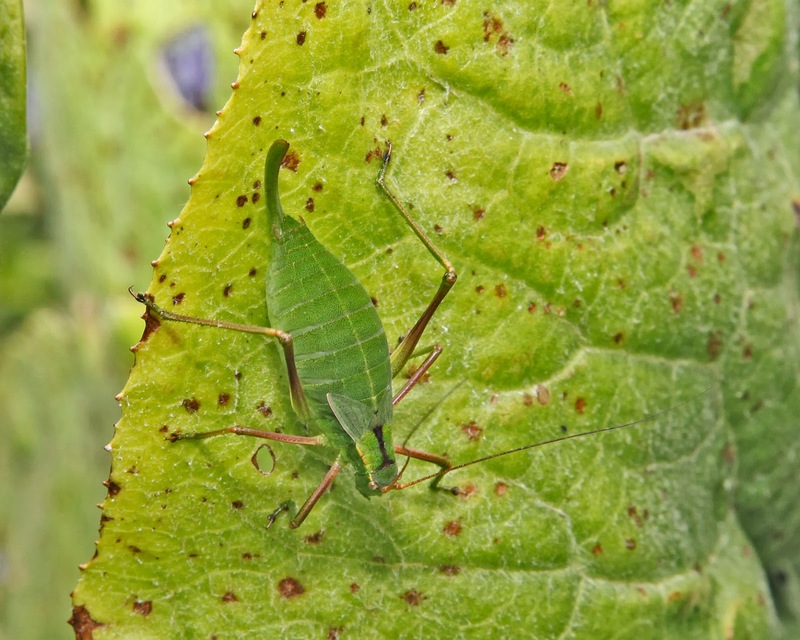 This katydid was discovered last night in the garden. It probably overwintered as a nymph and is now an adult just as the temperatures are rising. 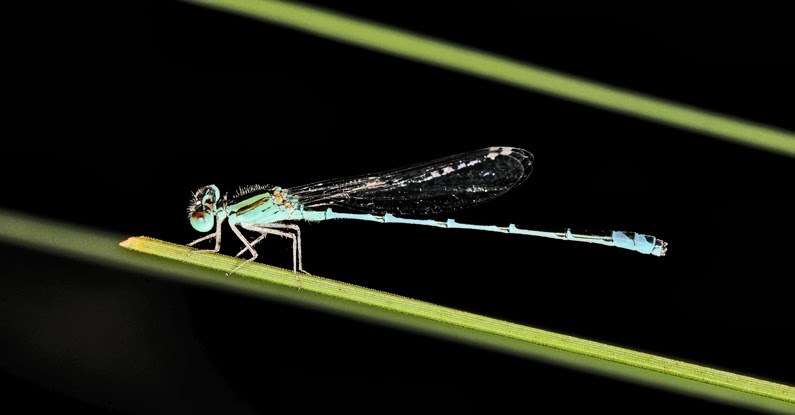 It is one of four species recently described in the genus. (Rentz, et al., 2010). All species are known from the northern rainforests along the east coast of the continent. Many others in this and other genera occur in New Guinea, Borneo and southeast Asia. They are nocturnal and are plant feeders. They have a low, stuttering call that is heard after dark. 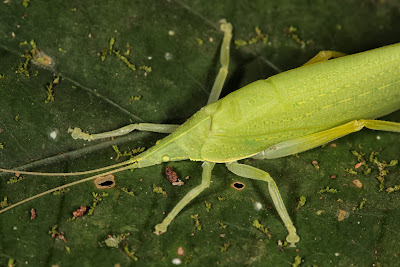 During the day the katydids usually perch on the underside of a leaf with the wings somewhat flattened rendering a boat-like appearance to the insect. One of the distinctive feature of this group is the projecting anterior margin of the forewing which not only covers a portion of the pronotum (thorax) but also conceals the thoracic "ear of the katydid. You can see this very well on the photo above. 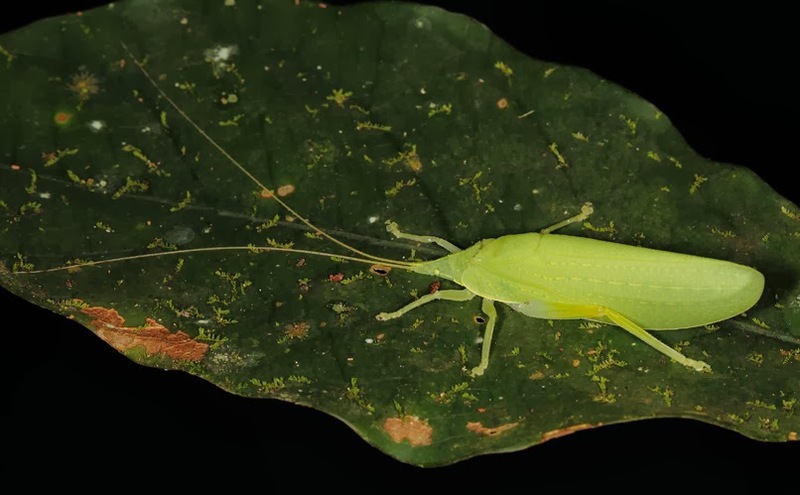 This species has been called the Chirping Leaf Mimic and is very delicate. It uses its green colour and secretive behaviour to avoid being eaten. 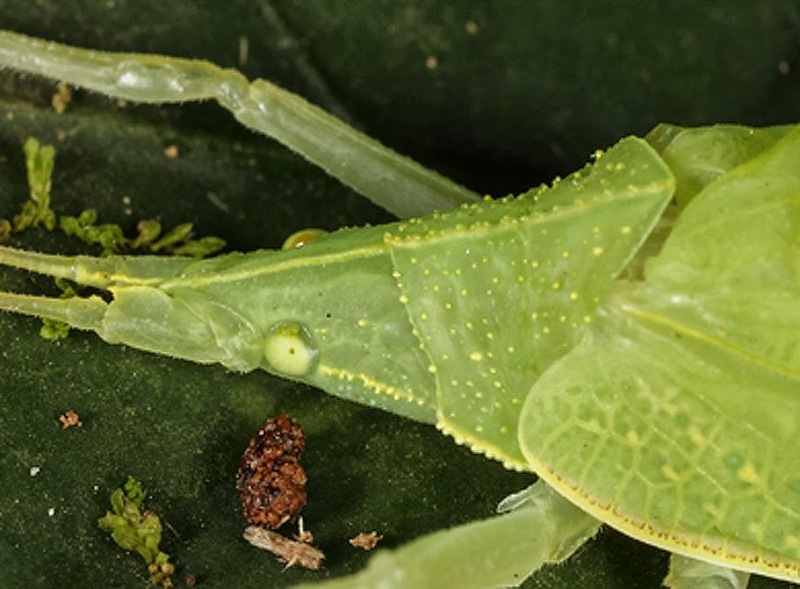 It has fairly long and sharp tarsal claws that enables it to cling to its substrate and not only to avoid being picked-off by a predator (or collector) but to hang upside down. Rentz, DCF, Su, YN, Ueshima, N. 2010. Studies in Australian Tettigoniidae: Australian pseudophylline katydids (Tettigoniidae: Pseudophyllinae; Phyllomimini). 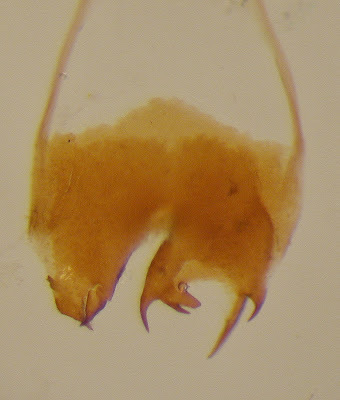 Zootaxa, 2566: 1-20. Cockroaches may not strike everyone's fancy but they are important members of the ecosystem. In fact, they may be more important than most people think because of their diversity and considerable numbers. 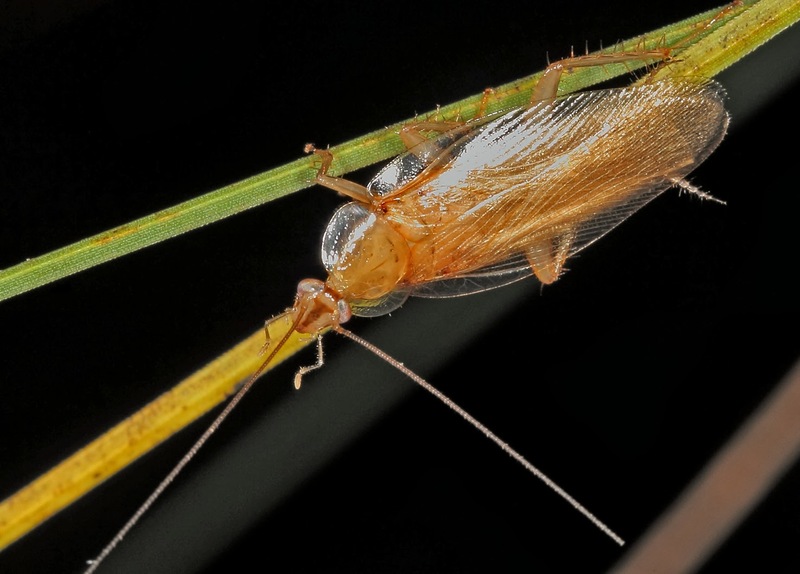 This little cockroach is a member of the large genus Balta which has many species in Australia and New Guinea. They are active after dark feeding on the particulate matter than rains down from the trees above. 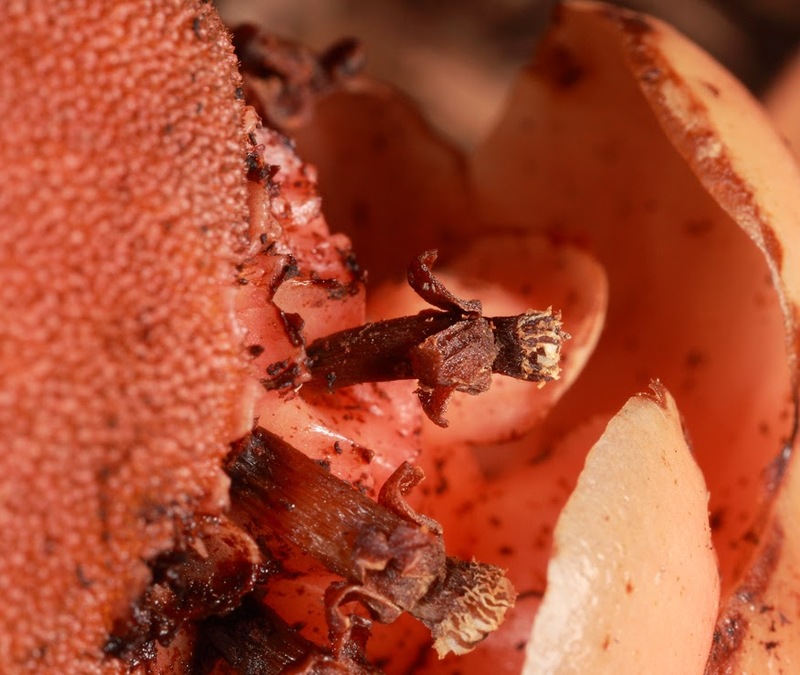 During the day they can be found in leaf litter or under loose bark. This genus is frequently attracted to lights. But don't worry, even if it comes into your house, it won't last long. It needs the humidity and foods of its own habitat. B. denticulata is appropriately named. This is the subgenital plate of the male of the species. The subgenital plate is a flap that covers the ventral part of the tip of the abdomen. It is very diagnostic in cockroaches. The specific name of this species is based on the spines you see at the apex of the plate. All males have spines that are very similar to these. It's been a long time between drinks! This blog has been inactive due to trips to the tip of the Cape York Peninsula, 3 weeks in China and trips to Canberra. But we are back to "normal" if that is the word. Mr Cassowary passed by a couple of weeks ago and left this calling card in the driveway. What's neat about this one is that it looks pretty much the same now as when he dropped it. Usually the turkeys go through the seeds during the day and the nocturnal mammals do it over after dark. But nothing has gone near it even though there is precious little on the ground and the turkeys are very hungry. Perhaps, the cassowaries have been feeding on some toxic fruits that the other animals avoid. Who knows. Subsequently we heard that his clutch of eggs had been destroyed, probably by pigs. Then recently we heard that a tremendous fight had broken out between Mrs Cassowary and a rival, named Harriet, and Harriet had won. Mr Cassowary has been observed mating with the new lady. If this leads to another nest, it will mean that he will be brining out the chicks much later than normal. We will keep you posted.